The dates have been announced for VERA’s ever popular Late Running evenings, when volunteers take over the operation of the railway for a few hours. The times shown are first and last car to each terminus. 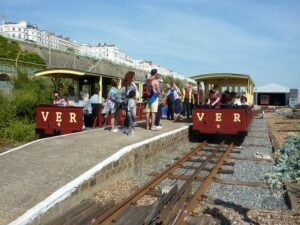 In 2018 we were blessed with good weather on most evenings and ran with large numbers of passengers, as seen here with VERA volunteers about to take over the service.